Sound design is one of the more overlooked areas of anime production, simply because hearing is a secondary sense to sight. At most there’ll be talk of the soundtrack, especially the sweeping, Hollywood-esque scores of big dramas. To give credit where it’s due, I consider soundtrack composition is a very important part of any multimedia experience, but it’s only one part of the overall sound design. Even then, it’s often the case that even the soundtrack goes unnoticed at most times. This is actually a good thing; sound, above all else, is used to build atmosphere. It should, rightfully, be ambient. This doesn’t mean that it’s simply; humans may not consciously recognise that we’re hearing the right sounds, but we certainly pay attention to the wrong sounds or, heaven forbid, a lack of sound. Therefore sound design must be meticulous to avoid any breaks in suspension of disbelief. This goes double in anime, where all your sounds are ‘artificial’. Your assorted pieces of key animation are never going to make sounds by themselves. You’ll have to add in whatever you deem to be appropriate. This talk may give the impression that sound design is all about authenticity, but this is not necessarily the case; we’re about to talk about comedy, after all, and realism is hardly comedy’s highest priority. Not that comedy doesn’t have to struggle with portraying authentic experiences, but it also has other considerations in sound design. Alternatively, Wikipedia has an audio file for a sting. Both of these serve the same purpose: to flag the existence of a joke. It may seem a bit patronising that we need to be told when to laugh, but it’s true that it’s a lot easier to find something funny when it’s implied you’re allowed to do so. Laughing is a social exercise. Research and anecdote have shown that it’s much easier to get people to laugh when they’re going it in a group. Call it peer pressure. Call it group mentality. Regardless, when they record comedies in front of a live studio audience, they know that the laughs in the audience come a lot easier than from the lone watcher sitting in front of his or her television. So even if your test audience thinks you’re funny, sometimes you need to be even funnier. Curiously, Japan has never embraced laugh tracks in the same way the West has. Instead, they tend to arrange their comedies into a different form: manzai. Exploring Japan’s comic tradition will have to be a different topic for a different day, so for now we should just note the straight man/funny man dynamic. Not only is the formula instantly recognisable by any Japanese (fulfilling the ‘joke flagging’ function) but having two characters play off each other also adds to the social element of humour. 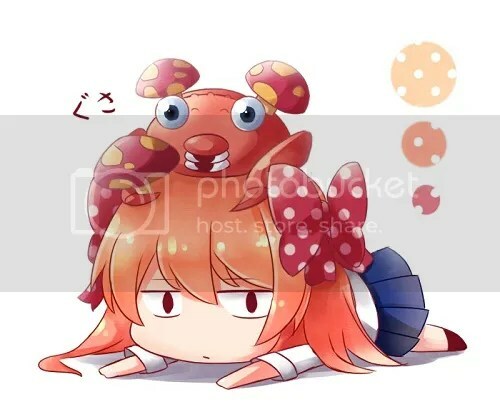 Sakura in Gekkan Shoujo Nozaki-kun is often the straight man. As more characters were introduced, even Nozaki gets to play the straight man. They’re our main characters. Our empathy for them helps us laugh. Funny music and funny sounds. This is just a manga frame, but the patter of feet nails it. Music is one of the big tools used to create atmosphere in a scene. Imagine a wacky chase scene without Jakety Sax. Or, imagine a really sombre scene with Jakety Sax. That’d be really wrong. Or it’d just be really hilarious. It’ll be like how they play What a Wonderful World every time the world is destroyed. Irony is funny. The point is, your choice of music manipulates the tenor of each scene, and that changes its meaning. 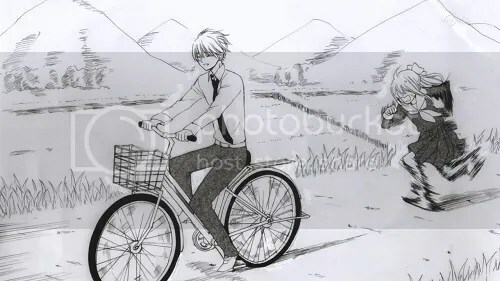 Watch the bike scene in Gekkan Shoujo Nozaki-kun again. Notice how each time they switch positions they change the music? It’s like the scene was funny in three different ways (and, because of the musical contrasts, it kind of was). And it’s just a skit about Nozaki being clueless about the romance of bicycles. That’s powerful stuff. Let’s not forget music’s smaller cousin: sound effects. Having all the right sounds (like a door slamming, the wind blowing, a train disappearing into the distance) is, again, very important. But there are also sounds that are just inherently funnier than others. Like whoopie cushions, because fart jokes are very mature. Or how ‘chicken’ is a funnier word than ‘bird’ and ‘spleen’ is funnier than ‘organ’. Something about the deliberate specificity and certain consonant sounds. 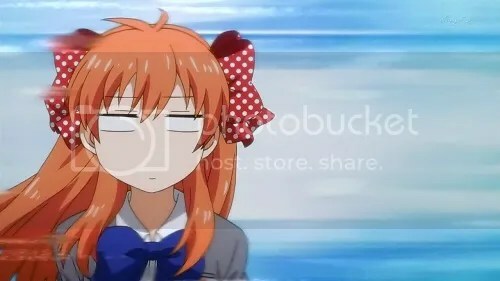 The great thing about Nozaki-kun has a sound effect for pretty much everything. Here’s a fun exercise: go through Episode 01 and note every time they use an irregular sound effect. Seriously, a sound effect for everything. Every time Sakura deflates, you can hear it. As can you when she does pretty much anything, from finding a volume of manga to being charmed by Nozaki with a cat. It goes back to that principle about energy in comedy, and Nozaki-kun has boundless energy. For a final exercise, try watching an episode of your favourite comedy with the sound completely muted. Turn on subtitles, and just watch. It’s just not going to be funnier anymore, and not just because the jokes aren’t fresh (though, admittedly, comedy relies heavily on surprise). They’ll still be telling the same jokes, but taking away sound takes away a crippling amount of tools used to make the funny. Normally I’d encourage readers to appreciate these intricacies a bit more, but in this case I’d actually recommend you all to…well, not. Sound is one of those things that are best when ambient. Diverting your attention to noticing them may actually take away from the experience, especially for a spontaneous medium like comedy. Save the dissections for after you’ve had all your laughs. Putting your mind to how things tick is a much more interesting experience after the entertainment.